I look forward to having a leisurely breakfast on Sunday mornings. I am not a big fan of fry up breakfasts, instead my my favorite is coffee with pastries and having yoghurts with fruits and nuts. There are so many combinations of flavours you can create by combining different flavours of yoghurts and fruits that you would never be bored. This simple strawberry smoothie bowl is so tasty and delicious and it really looks so pleasing to the eye served in this beautiful Sainsburys Home Bloomville range of dinnerware. 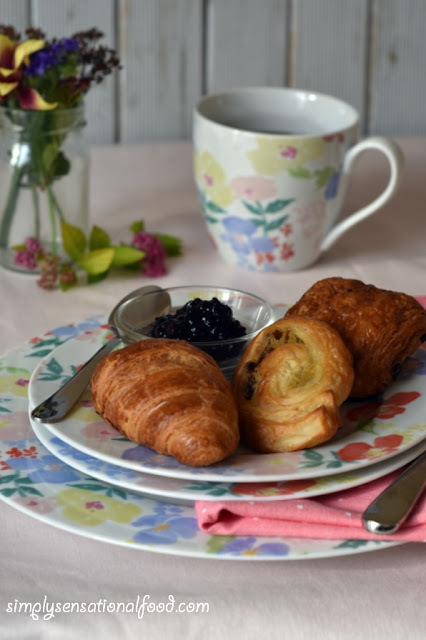 The Bloomville range comes in a pretty floral design in pastel colours, it is really cheerful and would grace any breakfast or dinner table beautifully. Available in the range are dinner plates, side places, pasta bowls, mugs, cake plates, coasters, trays, spatulas and wooden spoon and matching tea towels and oven gloves. The dinnerware is made from porcelain and is dishwasher and microwave safe. It is reasonably priced as most items start from as little as £3.00 each and you can purchase as many pieces as you want to make a set for two place setting to six place settings depending on your family size. You can also buy separate pieces should you need replacing anything. Back to my Strawberry smoothie bowl recipe, actually there is no set recipe!!! All you need is some yoghurt and fruits. Creamy strawberry yoghurt garnished with fruits, granola and honeyed almonds. 1. In a blender add three strawberries and the yoghurt and blend it for a minute.2. Pour the strawberry smoothie into a serving bowl .3. 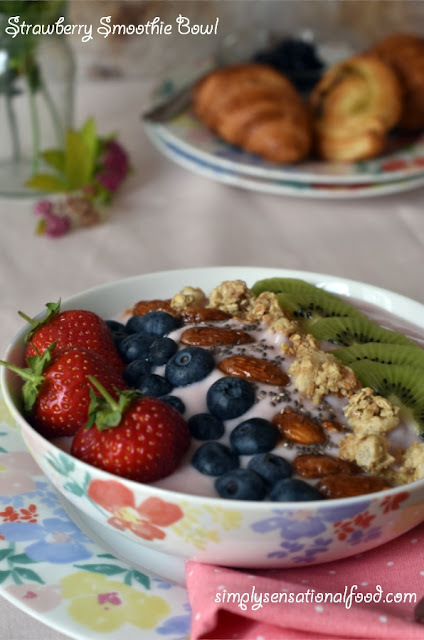 Garnish with the remaining strawberries, blueberries, kiwi fruit, granola and almonds and sprinkle with chia seeds. ** The dinnerware featured in this post was sent to me by Sainsburys Home, all opinions expressed in this post and pictures are my own. Definitely , smoothie bowls are a great invention and they look so pleasing to the eye too especially when presented in such pretty bowls. Ooh this looks delicious and love the look of the plates and bowls, such a pretty design. Love the look of this dinnerware, it's so cheery and perfect for weekend breakfasts. Its lovely and cheerful . Yes its such a pretty dinnerware set. This looks really good. Summery, yet full of flavor. and your pictures are really good! I hope you do, I am sure yours is going to look fabulous. 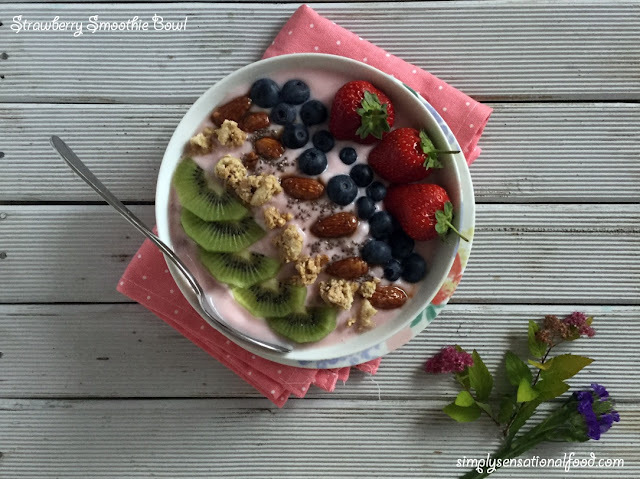 It seems like such a simple idea but smoothie bowls really do look so appetising! I think it could also be a great way to get little ones to eat more fruit and yoghurt! You are absolutely right , its a great way to encourage little ones to eat more fruits. I love healthy food that are so beautiful to look at! I would love to try it! It looks yummy!!! We est with our eyes so beautiful is more inviting . Nayna I too love my yogurt, granola and fruits and nuts in the mornings. Its filling and yet light on the tummy. I so love the floral dinnerware, very summery. Definitely Mayuri, I love my fruits. I'm hungry 😋 . Breakfast is a big things go me and I love smoothies. They way you present it the dish make everyone love to try it . With that as breakfast I would wake up easily every morning! It seems easy to do so I will go straight a head to the store and make them for tomorrow morning! Oooooo yummy. I love strawberries and they still taste great this time of year so this smoothie bowl would be a treat for breakfast. I have to try it! 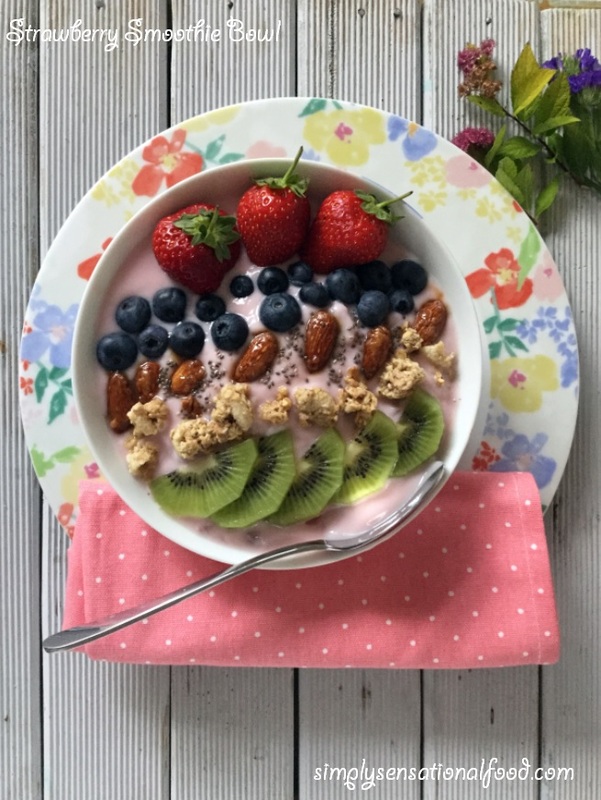 Delicious looking strawberry smoothie bowl,an ideal breakfast thank you for sharing. This sounds and looks amazing, I have never written tried Chia seeds before. This looks so yummy and tasty, plus really healthy too. That dinnerwear is lovely! I love Sainsbury's for homeware, can be a bit of an addiction sometimes that I don't turn down that aisle. The smoothie bowl is gorgeous, can never beat Strawberries. Delicious. Ooh these look lovely! We need to eat more smoothies, I'm not big on breakfast but I could stretch to a smoothie I think! Nothing can beat this healthy breakfast. We can make with any seasonal fruits. It looks delicious and love the design of the plates and bowls. Thanks for sharing the recipe. That looks incredible. My toddler absolutely loves things like this so I'll certainly be having a go at the weekend and I'll let you know his verdict! it's not just beautiful and yummy but also very healthy! Love the bowl and plate, they are so pretty. I've been looking for replacements for months now, I'm far too fussy for actually selecting a set I like. Last Sunday, our breakfast was veggie sausages and sand on a windswept beach on Lindisfarne. Seemed like a good idea at the time, but in hindsight, I think a strawberry smoothie bowl would have been a little friendlier. Oh my. This looks divine. My mouth is watering and how easy is it to make. I will be looking at this when I return home. Looks so healthy and yummy.. i love the simplicity of making this breakfast. Thanks for sharing. Such a nice, healthy breakfast! I've never heard of smoothie bowls, but I am loving this idea. I bet even my kids would eat it. And yes, the dish is beautiful, too. This looks really delicious! I love strawberries & kiwi's! Great energy boosting breakfast to start the day. I love berries for breakfast and my idea of the ideal brekkie would be homemade pancakes and a selection of berries with a little creme fraiche. Bliss! Its quite similar to your delicious berry breakfast too. That looks so amazing. I love strawberries and add smoothie to it and I'm totally down. I could definitely get used to waking up to breakfasts like this every day. My mom would love this. I am going to make this for her breakfast on Saturday morning. I will go to her house early and make it for her. She loves strawberries and she'd be delighted to have a smoothie bowl as delicious as this. Thanks for the idea. Oh this looks so very delicious! I will have to try this on my breakfast! Thanks for sharing. Thank goodness for this post!! i've been looking for a healthy breakfast recipe that would be easy to make but still satisfying! cant wait to try this recipe! This looks delicious. I love smoothie bowls and this one contains all of my favourite fruits. A great breakfast! Yummmmm!!! This looks so healthy and delicious, I'm going to try this for my work breakfast next week! Yuuummm! All my favorite fruits in one bowl. I'd love to have that in front of me right now.